The objective of this ebook is to provide to the readers the most recent state-of-the-art on physicochemical properties of biopolymers and their related end-uses applications. Biopolymers are usually described as polymers produced in a natural way by living species. Their molecular backbones are composed of repeating units of saccharide, nucleic acids, or amino acids and sometimes various additional side chains contributing also to their functionalities. If the largest part of biopolymers is extracted from biomass, such as polysaccharides from cellulose and proteins from collagen, milk or wheat, biopolymers can also be produced from monomers using conventional chemical processes as polylactic acid, or directly in microorganisms or genetically modified organisms, as polyhydroxyalkanoates. The genetic manipulation of microorganisms brings a tremendous potentiality for the biotechnological production of biopolymers with tailored properties quite suitable for high-value medical applications such as tissue engineering and drug delivery. Biopolymers from renewable sources, on the contrary display structural complexity and natural variability that need to be deeply studied and characterized before probing into the structure-function relationships for further applications. Research on natural polymers has focused on developing more environmentally friendly applications to reduce pollution caused by non-biodegradable material. Historically, biopolymers were mainly used by mankind as food, or for making clothing and furniture. Since the industrial time, fossil fuels such as oil are the greatest source in the development and manufacture of almost every commercial product, such as the plastic, which is currently used at a very large scale. But these fuels are not unlimited resources, and environemental concerns over all aspects of using fossil fuels for production and energy must be taken into account. We must act in a sustainable manner, which means that the resources must be consumed at a rate such that they can be restored by natural cycles of our planet . Therefore, in recent years, the renewable nature of biopolymers leads them to a renaissance and a new considerable interest by industry due to the unique properties, including biodegradability, biocompatibility and nontoxicity, of biopolymers. To fulfil all these different functions, biopolymers must exhibit rather diverse properties. They must very specifically interact with a large variety of different substances, components and materials, and often they must have extraordinarily high affinities to them. Finally, they must have a high strength. Some of these properties are utilized directly or indirectly for various applications. This and the possibility to produce them from renewable resources, as living matter mostly does, make biopolymers interesting candidates to industry . As a consequence of their properties, these biopolymers derived from natural products have found a place of choice in areas as diverse as effluent treatment, papermaking, chemical, food, cosmetic, pharmaceutical, petroleum and textile industries, as well as in analytical chemistry (biosensors) and molecular biology. However, biopolymers have to compete with polymers derived from fossil fuel not only because of their functional properties but also in terms of cost. In this respect, biopolymers are competitive when the price of oil is high and the price of feedstocks, such as starch from corn, is low.1 The continuing development of new and existing biopolymers will enable these materials to help supplement the increasing global demand for biopolymers-based products and to develop new markets with their niche applications. The most common biopolymers used for industrial applications and thoroughly considered in this ebook are polysaccharides from plant, algal, microbial and animal origins such as starch, cellulose, lignin, arabinoxylans, sulfated polysaccharides from seaweeds, galactomannans and xyloglucans from brazilian seeds, chitin and its derivative chitosan. Natural gums such as mesquite, tara and arabic gums are also widely used in food and non-food industry and are dicussed in this ebook. Animal and plant proteins such as collagen, gelatin, albumin, dairy proteins and wheat, corn and soy proteins are also considered as sources of proteins for biomedical, microencapsulation and plastic foams applications. Nucleic acids such as DNA and RNA and their related applications in genetic engeenering for instance are not considered in this ebook. This ebook presents a comprehensive review and compile information on biopolymers in 27 chapters covering from isolation and production, properties and applications, modification, and relevant analytical methods to reveal the structure and properties of some biopolymers. Authors write this ebook from Argentina, France, Mexico, Spain, Iran, Brazil, Egypt, Turkey, Venezuela, India, Russia, Portugal, New Zealand and Malaysia. This ebook has tried to arrange the ebook chapters in a subject order to make it easier for the readers to find what they need. However, the reader can still find information on the same subject in more than one Section. Section A, which includes one chapter, is mainly an introduction to biopolymers. It includes concepts and molecular weight determination. Section B, which includes twelve chapters, refers to some physical chemistry determinations of biopolymers. Section C, which consists of two chapters, deals with studies on hydrodynamic properties of biopolymers. Section D, which consists of one chapter, refers to theoretical models for biopolymers. Section E, which includes four chapters, refers to special cases of polysaccharides separation and purification. Section F, which includes seven chapters, deals with applications of biopolymers/hydrogels in drug delivery systems, biomaterials, biothermoplastics, bio(nano)composites, bionanostructures, biocapsules, bioadsorbents, bioelectrospinning and biopackaging. This section deserves a special attention because it forms a fascinating interdisciplinary area that brings together biology, chemistry, materials science and (nano)-technology. This ebook is expected to be of help to many graduate and post-graduate students, professors, scientists, pharmacists, engineers and other experts in a variety of disciplines, both academic and industrial, dedicated to the determination of polymers and biopolymers properties. This ebook may not only support research and development, but also be suitable for teaching. The audience will benefit with an excellent review offering advanced knowledge about technical determinations and physicochemical properties of macromolecules, a thorough knowledge of hydrodynamics and different methods of characterization. Readers will find in this ebook a triple deal, including educational, scientific and industrial applications. 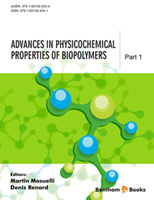 The first main objective of this e-book is therefore to highlight the progress in different techniques of molecular weight determinations and physicochemical properties of biopolymers. The last two decades have seen a number of significant advances in the methodology for evaluating the molecular weight distributions of polydisperse macromolecular systems in solution at the molecular level. These advances have centered on the coupling of chromatographic or membrane based fractionation procedures with multiple detectors on line such as multi-angle laser light scattering, refractive index, UV-Vis absorbance and intrinsic viscosity detection systems. Recent advances in SEC-MALLS (size exclusion chromatography coupled to multi-angle laser light scattering) and FFF-MALLS (field flow fractionation coupled on line to MALLS) applied to complex polymers from renewable resources are therefore presented in this e-book. Beyond molecular charcaterization using HPSEC-A4F-MALLS technique, tremendous efforts were made these last years to elucidate the structural variability and complexity of polysaccharides using matrix-assisted laser-desorption ionization (MALDI) and electrospray ionization (ESI) mass spectrometry coupled or not to nuclear magnetic resonance (NMR) spectroscopy. One chapter of this ebook in section B considers the sequence, interresidue linkage position and substitution pattern of sulfated polysaccharides after enzymatic hydrolyses. The most widely used method for the dynamic characterization of macromolecules in solution is the capillary viscometry, as it is a simple and economic method. Although in literature there is much information on hydrodynamic measurements from intrinsic viscosity determinations, very few of them evaluate the conformation of different biopolymers. The importance of this type of study lies in the analysis of the polysaccharides or proteins behaviour in industrial processes and product quality control after extraction and purification. These physicochemical studies help to elucidate the chemical structure, macromolecular conformation and the ability biopolymers have to form gels, films, agglomerates, etc. A particular attention is paid in this ebook on the intrinsic viscosity determination of proteins and strong synthetic polyelectrolytes for which theoretical models always need to be implemented in order to get reliable dynamic structural informations. The ebook also focuses on the structural analyses at the mesoscopic scale using mechanical analyses, microscopy, small angle scattering and free volume measurements and different applications related to biopolymers such as biomaterials, microcapsules, biothermoplastics, nanostructured biocomposites, super-absorbents, bioelectrospinning, biopolymers-based dermal and transdermal drug delivery systems, and biopackaging. All these applications using biopolymers aim to provide a means to reduce dependence on fossil fuels, and decrease the environmental impact of non-biodegradable materials. The main challenge to overcome with biopolymers-based materials is the control of biopolymer-biopolymer interactions, a challenge always present and discussed throughout the ebook by authors. To conclude, the content of this ebook will bring its readers a basic understanding of the physical chemistry of biopolymers, but also the latest findings about new macromolecules recently discovered and published. Theoretical aspects of computational structural description of biopolymers are also thoroughly described. Therefore, this ebook will appeal to different readers as a great source of knowledge about the science of biopolymers. Thomas, Sabu; Durand, Dominique; Jyotishkumar, P..; Chassenieux, Christophe, editors. Handbook of Biopolymer-Based Materials: From Blends and Composites to Gels and Complex Networks. . 1st. Wiley-VCH Verlag Gmbh and Co. KGaA; 2013. Steinbüchel, Alexander, editor. Biopolymers. 10. Wiley-VCH, Weinheim; 2003. We first would like to thanks all the authors contributing to the realization of this ebook. We would like to thank the Agronomic Research National Institute, France and the Área de Química Física - Departamento de Química - Facultad de Química Bioquímica y Farmacia - Universidad Nacional de San Luis – Instituto de Física Aplicada – CONICET, Argentina for giving us the time and opportunity for the writing and edition work of this ebook. We are grateful to the editing team at Bentham eBooks for their help, especially Humaira Hashmi and Salma Sarfaraz. Finally, we wish to express our gratitude to our spouses, Maria Gabriela and Marie-Christine, for their patience and support during the long hours of writing, reviewing, commenting, editing of this ebook.